'All That Plaid' is a quirky series of items that mixes plaid prints with various bird, tree and flower motifs. It contains discs and inlays of mother of pearl, enamels, Swarovski crystals and burnished metal charms. Available in rhodium silver/purples OR gold/green colourways. Adjustable necklace with a mixed charm pendant. 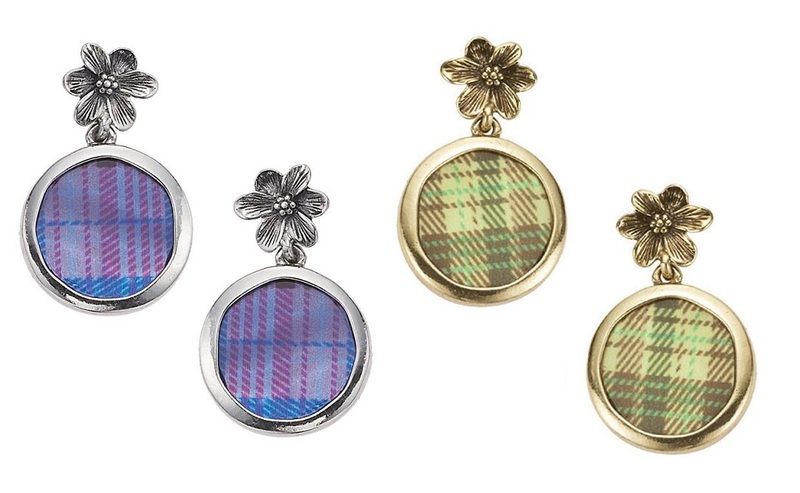 This pretty necklace combines an array of different mediums including: a framed iridescent mother of pearl disc with plaid design (1.8cm/18mm), watercolour enamels, mother-of-pearl inlaid bird disc (2.5cm/25mm), and a tree (2cm/20mm). 41cm/16 inches to an adjustable 49cm/19 inches. Adjustable necklace with a mixed motif pendant. This pretty necklace combines an array of different mediums including: a framed iridescent mother of pearll disc with plaid design and inlaid bird disc, watercolour enamels, raised flower and a tree. The pendant is 8 cm/80mm in length, the tree motif measures 2cm/20mm and the largest disc with inlay measures 2.5cm/25mm. 41cm/16 inches to an adjustable 49cm/19 inches. Adjustable necklace with a larger disc pendant. This features a mother-of-pearl disc with plaid design and bird overlay. The disc measures 5cm/50mm. The back (not pictured) is decorated with a bird cut-out. 41cm/16 inches to an adjustable 49cm/19 inches. This pretty bracelet combines an array of different mediums including: an iridescent mother-of-pearl disc with plaid design and inlaid bird disc, watercolour enamels, raised flower, tree and bird motifs. Smallest bird motif 1.5cm/15mm largest plaid disc 2.8cm/28mm. Adjustable length 19cm/7 inches up to 24cm/9.5 inches. This pretty disc link bracelet combines an array of different mediums including: iridescent mother-of-pearl discs with plaid design, inlaid bird discs, watercolour enamels, raised flowers, and Swarovski crystal set discs. Smallest disc 1.5cm/15mm largest disc 2.3cm/23mm. Stretch style, it stretches to fit all wrists comfortably. Unstretched measures 18cm/7 inches. Flower and mother-of-pearl disc earrings. Stud fastener for pierced ears. Flowers measure 1cm/10mm and the discs measure 1.8cm/18mm. Total length 3 cm/30 mm. 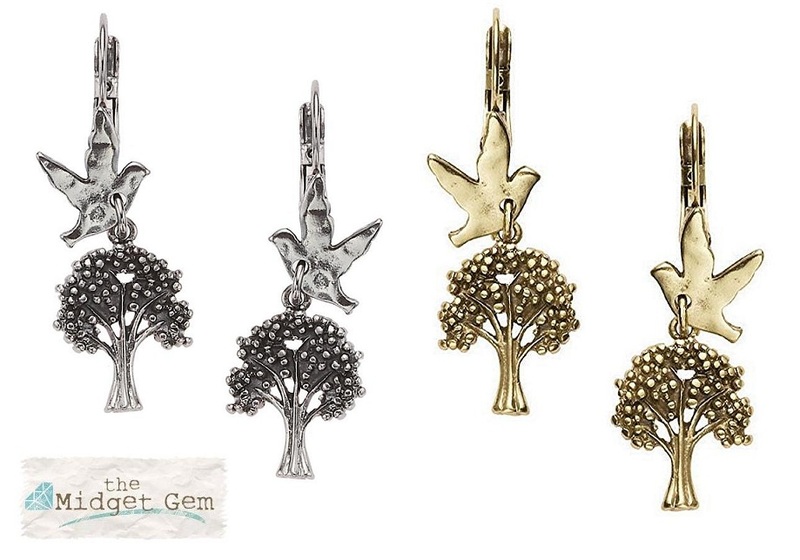 Bird and tree earrings with french clip hook for pierced ears. Charms measure 1.2cm/12mm (bird) and 2cm/20mm (tree). Total length 4.5 cm/45mm.